Ancient is all relative, of course. Sharon was founded in 1740, and some of these gravestones date to the late 1700's. 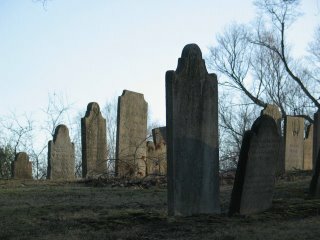 I pass by the cemetary every day as it's on my way to work, and on the path of my morning walk. In the early morning, in early Spring, it's eerily beautiful. When I took this picture, the air was filled with the sounds of birds - chickadees, titmice, crows - it was quite a racket. Welcome to the DP family. Connecticut is famous for it scenery and I am sure we will enjoy your photos. Your link has been added to the DP Map and my DP site. Best wishes and have fun. Welcome to the Global family. It is so great that we have all sizes and shapes - just like a real family. At least with 2000 people, you can go for years just taking photos of your neighbours. Loved the mail-box and flowers. Hey! We're next door neighbors! I'm doing the Providence blog. =) Welcome! I just started this week, too! hello jenny and welcome to the DP family! I've been wanting to post a picture on gravestones but it looks like you beat me to it! That's one thing I love about Spring - hearing the birds sing again! It's been so quiet in Winter... Welcome to the Daily Photo Family! I love 'small town' America,so I am looking forward to your photos. Welcome.I have added you. Hi, greetings from Hong Kong and welcome to the DP family.